Langtang Panorama View Trek | Adam Tours & Travel Pvt. Ltd.
Langtang Panorama View Trek is exclusive and one of the best trekking trail in Langtang Himalayan ranges. This trekking combines Langtang Valley and Gosaikunda Lake offering numerous stunning views of mountains with rare veracities vegetation and glimpse sight of wild life. The Langtang Panorama trekking route goes through traditional, ethnic Tamang heritage villages and untouched forests with rhododendron, juniper, pine and bamboo. This trek offers an opportunity to explore villages, to climb small peaks and to visit glaciers and scared lakes at a comfortably low elevation. Drive from Kathmandu to Syabru Bensi takes you to the journey of Langtang Gosaikunda Helambu trail. Langtang panorama hiking gives you the opportunity to get right in among the Himalayan peaks and to get off-the-beaten-track, walking through some fascinatingly remote and relatively unpopulated areas. Most of this region falls into Langtang National Park. The 1,710sq km Park hosts a variety of natural splendors, from lush valleys alive with languor monkeys to the towering fir and rhododendron forests bursting with spring color. The Langtang panorama trail’s forests are also well known for their wildlife including red pandas, Himalayan black bears and wild boar and for rare tree orchids and the colorful rhododendrons. Ascending through pastures arrive at meadows of Kyanjin Gompa. Spectacular mountain views of Langtang Lirung, Dorje Lakpa, Mount, Gaurishanker, Mount Ganesh Himal, Langshisa Ri, Gangchenpo, Yala peak and Naya kanga seems to be marvelous through out the way. The Langtang Panorama adventure climbs more steeply to Gosaikunda trail through farmland and above the tree line up an alpine ridge that offers a huge Himalayan panorama, to reach a rocky bowl studded with scared high altitudes lakes. There are 108 lakes in this area but the most popular are Gosaikunda (4460m), Saraswatikunda and Ganeshkunda nearby each other. Every year, these sacred places are visit by thousands of Hindu Pilgrims during the month of August. Finally we will return to Kathmandu after two day hiking through Sing Gompa and Dhunche, following the road uphill via the south bank of Trisuli Ganga through the fields and pastures. 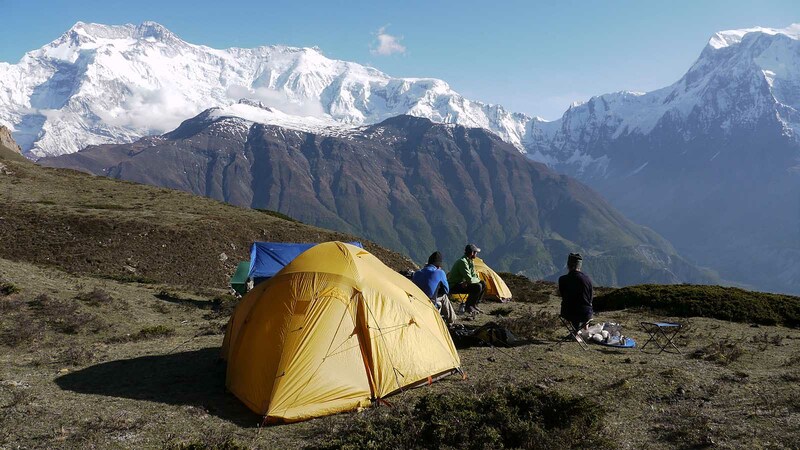 Langtang Panoramic Region Trek can be the best trekking destinations for all those who enjoy natural landscape and distinct cultural practices along with bio diversity and medley mountains views. After morning breakfast we drive out along the north-western hills of Kathmandu for about 7-8hr. You will witness nice scenery of white snowcapped mountains like Mt. Annapurna II, Manasalu, Ganesh Himal and other minor peaks along the route and as well as green scenery of hillock, rivers and village. Enjoy the Himalayan views and mountainous lifestyle through the terraced fields and rustic villages. The scenery of foothills and ridgeline vistas goes through the Trishuli Bazaar, Betrawati and Dhunche you feel as if you are heading towards deep land. We take our Lunch at the Trishuli Bazaar before continuing further toDhunche. We descend down to Syabrubesi for the overnight stay. The first day excitement trail crosses through the Bhote koshi River flowing down from Tibet and following the Langtang Khola. After a visit to the Gompa of Guru Rinpoche, follow the stone-paved main street out of town over Langtang Khola. After crossing the suspension bridge the trail gradually ascend up to Bamboo passing by landslide. The trail goes through the sub tropical forest which is cover by oak and maple, massive spruce, fir and blue pine. We pass through the forests of oak and rhododendron. The variety wildlife; yellow-throated martens, wild boars, Langur monkeys, red pandas and Himalayan black bears etc. are inhabitance of the forest. Afterwards, your trek ascends gently to Rimche (2400m). And at the end your trail is level to the Lama Hotel for the overnight stay. The day start with a gentle climb, but it soon becomes steeper, climbing through wild forests of hemlocks, oaks, maples and white and pink rhododendrons high above the Langtang Khola. The tantalizing glimpse of snow capped peaks start appearing along with fleeting view of Mt. Langtang Lirung (7244m) through the trees. The trail leads to a log bridge and on climbing further we come across lush meadows of Ghora Tabela (2992m).The trail ascends gradually as the valley opens up into classical U-shaped glacial. Follow the trail across the helipad and yak pastures, climb briefly through rhododendrons and scattered Tamang villages. The trail crosses a stream and climbs past several water driven mills and prayer wheels to the large settlement of Langtang (3430m), headquarter of Langtang National Park. The village has flat- roofed Tibetan style house and elaborately carved driven windows of the upper village is worth exploring. Valley is surrounded by stone walls enclosing fields where buckwheat, potatoes, wheat, turnips and barley are planted and easy to find yak and the wild goats wondering around you. The trail winds through the village and climbs a ridge topped by a large chorten. It then climbs gradually past an impressive mani wall, crossing a stream to the small village of Mundu (3442m). After crossing several small streams with wooden cantilever bridges and moraines, you can finally see the monastery of Kyanjin Gompa and the dramatic icefall flowing from the peaks of Langtang Lirung and Kimshung. The surroundings are interesting also because of the famous Government operated Cheese factory. We have chance to test cheese and curd by Yak milk, it is remarkable of this place. After having lunch, we can explore the area with abundant panoramic views of Langtang Lirung (7246m), Genjempol, Kyangjin RI (4750m. ), Tsergo RI (5000m. ), Ganja la (5160m. ), Langshisa- Ri (6427m. ), Dorje Lhakpa (6430m. ), Naya Kang (5844m. ), Yala peak (5500m). Today is the rest and exploration day of the trekking .We visit the monastery and the cheese factory or may walk up the moraine to see the spectacular ice faces and tumbling glaciers of Langtang Lirung or ascend Kyanjin Ri (4350m) and Tserko Ri (5,000m), which is highest point of this trek. Hike easy for a breath-taking panorama of the Langtang Lirung, Langtang range, Kinshung, Yansa Tsenji. We also have options to do a side trip to Langshisa Kharka. There are several alternatives sided trips, the surroundings areas of North having many smaller uninhabited valleys. Spend your night back to the Kyanjin. The beginning trail gently descends along the river to the landslide then passes through pine and Junipers forests steeply up to Thulo (Big) Syabru. The trail offers magnificent views of red pandas, boar, monkeys and various species of birds. The Tamang Cultural Heritage “Thulo Syabru Gaun” preserves wonderful ethnic custom, culture and their traditional. Here, you can enjoy the amazing landscape and the magnificent nature with splendid views of Ganesh Himal (7110m), Langtang Himal and its ranges. Rest of the day explore around the small village of Syabru. The trails lead us from Thulo Syabru follows a steep ascent path passing through Dursagang (2735m), passing a line of chotens. Along with the breathtaking views of Langtang Himal, Ganesh Himal, Tibetan Mountain, the trail continues steeply through the forests of oak and hemlock and then less steeply through rhododendron forest and pastures to the top of the ridge at Phoparng Danda (3190m). Watch the Langur monkeys playing in the forest and a fine sunset views over the Ganesh Himal. The larger trail cuts across the ridge top, staying fairly level through silent moss-covered forests. Then the path gently ascends for a while and follows a flat level to the Sing Gompa. The local well managed cheese factory and a Buddhist Monastery’s can be the visiting places which provides panoramic views, exhilarating nature. Spend your night at teahouse. The trail today takes two parts. Initially the trail climbs steeply up a ridge that marks a transition zone between rich, moist mountain forests and dry scrub vegetation on the slopes. Slope is the sanctuary for the red pandas and providing magnificent view of snowcapped Ganesh Himal. The trail to LauriBinayak (3920m) is steep & continues for three hours. We follow a rugged trail with dramatic views to the west; Manaslu range, Ganesh Himal range, Tibetan peaks and to the north also across the valley is Langtang Lirung. From LauriBinayak, the trail ascends now in alpine country above the tree line. Cross a small ridge to see first view of the holy lake of Gosaikunda. There are about a dozen lakes around Gosaikunda Basin, the main three being Saraswatikunda, Bhairabkunda and Gosaikunda. The myth is, Gosaikunda was created by Lord Shiva when he pierced a glacier with his trident to obtain water to quench his thirst after having swallowed a poison which threatened to destroy the world. Hundreds of pilgrims come here to worship and bathe during the full-moon festival every August. Trek down back to Sing Gompa for about 4 and half hour working. The trail descends all the way to Sing Gompa passing LauriBinayak with magnificent mountain views and forests. Also you can enjoy the back views of magnificent mountains with returning path. The trail begins with descend through pine, silver oak and rhododendrons forests with marijuana plants reaching to the tiny village of Deurali (1660m). Then begin the steep down journey from the ridge crossing wooden Bridge over the Sing Gompa Stream. Follow the road uphill that follows the south bank of Trisuli Ganga through the fields and pastures. From this point, our path goes even through some human settlements and reaches Dhunche, the headquarters of Rasuwa district. Drive back to Kathmandu by bus which is about 7-8 hours journey. It is a pleasant drive back to Kathmandu enjoying the natural varieties of Nepal. You will have lunch on the way bus stop station and continue drive to Kathmandu, transfer to hotel, evening we will have cultural Nepali Dinner show. Pack up your entire luggage and check for anything you left. This can be the last minute preparation to leave. We will drop you to the International airportto catch your flight back to your home and wish for your Safe journey. Best Travel Time: February – May, September – November are the best seasons. However, Dec and January are winter and quite cold but trekking can be done, June, July & August are the rainy season and visibility is poor due to rain and fogs.from June to Mid September road can be blocked due to rain and may need to change the local vehicle in between.